Since June 1 of this year, and through October 28, the Bodleian Libraries in Oxford have been displaying an extraordinary selection of items from their Tolkien collection. The original map of the Lonely Mountain, complete with pointing hand and runic inscription. Watercolors by Tolkien of Hobbiton, of Bilbo’s conversation with Smaug, of the Eagles, of the escape from the wood elves. The original design for the dust jacket of The Hobbit, including a publisher’s note to disregard the red that Tolkien wanted, as this would have raised production costs. Tolkien’s desk. A pipe. Numerous fan letters, not least from a young Terry Pratchett. A map of Beleriand. Some of the objects show Tolkien’s work process: there is a timeline that helped him keep track of who was where when after the breaking of the Fellowship, there are notebooks that he used for writing. There are more personal works: Christmas letters to his children, visionary watercolors from well before The Hobbit was published. The curators seem very proud of a projection of the design from the gates of Moria at the exhibit’s entrance, and of a multimedia relief map of Middle Earth that changes from light to dark and shows the course of various journeys in Tolkien’s work. 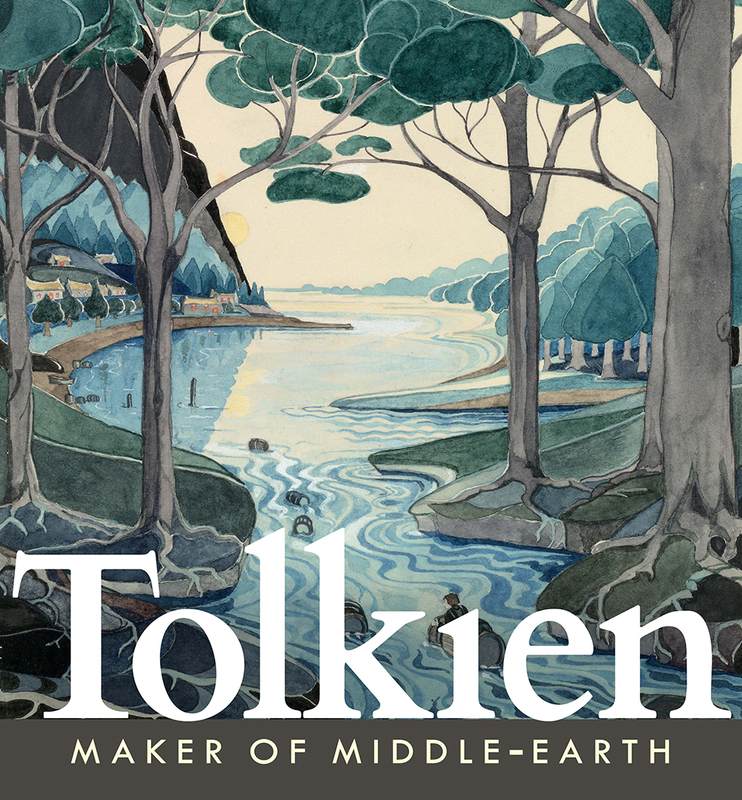 They are both pretty neat, and surely involved a good bit of work to create, but they are secondary to the works from Tolkien’s own hand, and from the objects and documents that help illuminate his life. The exhibit showed me how very early Tolkien was orphaned, and how tight his finances were for many years. He asked his publisher that he be paid for the illustrations that he prepared for the books; he did extra work during the university holidays; he re-used spare examination books for writing. 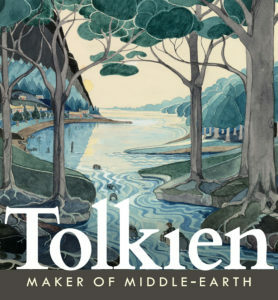 Middle Earth is a cultural juggernaut now, but it was not for much of Tolkien’s life. Other visitors have commented on the items showing Tolkien’s experiences in the Great War, and drawn conclusions about how that affected his writing. I was reasonably familiar with that part of his history, so I did not spend much time with those objects. The exhibition as a whole is not large. It is all contained within one room at the Weston Library. Tickets are free and bookable in advance online, though a limited number of entries are available each day, and they have been known to run out. The well-stocked gift shop next to the exhibition is only free to people with much more willpower than I have. 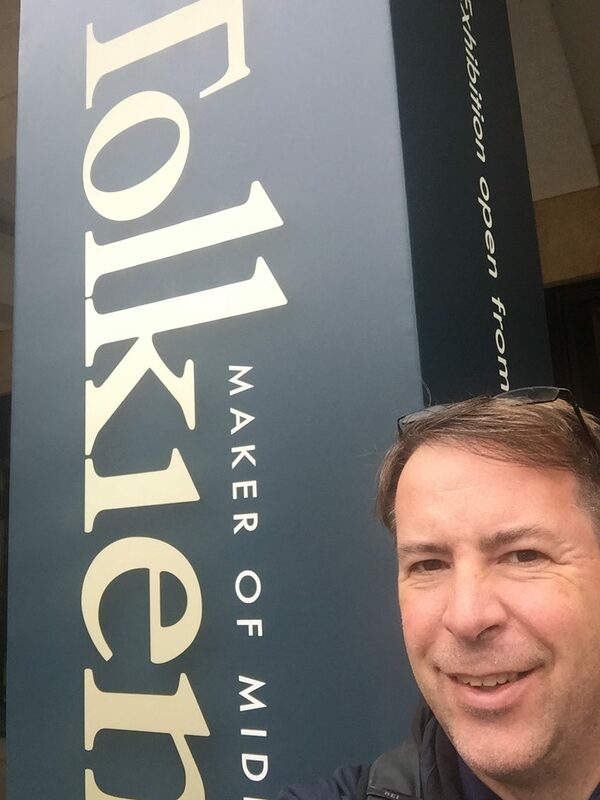 I was thrilled to see the paintings, drawings, and maps from Tolkien’s own hand. It was well worth a trip there and back again from Oxford.